It's finally almost the first day of school. She's had all summer off,and it's been a long one, so we hope she's prepared to go back to her studies. We're sure she'll be glad to see all her friends, and to hit to the books to learn about all kinds of new things. And we're sure she's going to want the hottest new clothes and fashionable styles to wear to classes. The looks that are super popular and trendy and cool! We did mention that the year is 1955, right? If your girl was about to head to class back in the 50s, chances are she'd wear a Poodle Skirt. And if she's in the mood for a throwback look, this blue Poodle skirt will be the perfect choice! This stylish skirt is done in the classic style, with a printed cartoon dog, and an embroidered leash. 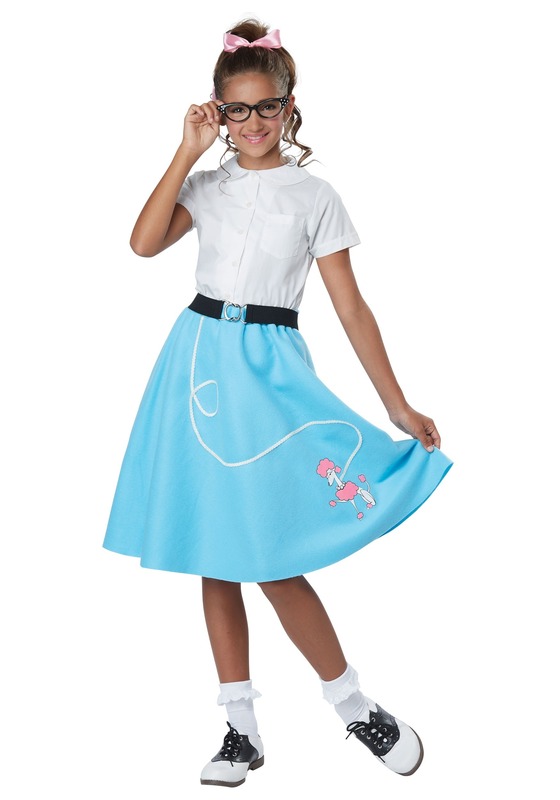 Complete her look with all the other fashionable items from the era, like cat-eye rim glasses, bobby socks, and saddle shoes, and she'll be the sharpest young whipper snapper in her Elementary. No time travel required!